Going for a party or a wedding? Or are you the bride or groom to be? Well then, its time to put your best face forward, literally. Get your face up and ready with our various services comprising of Party Make up, Interview Make Up, Portfolio Make Up, hairdos, saree draping etc. The creative touch of our makeup performer can bring out the most excellent in you. We are providing high end makeup with best products .We believe in providing best quality services. Make-up is a girl’s best friend and it is all about enhancing your beauty and overall look. Makeup can be simple or elaborate depending on the occasion. The highly skilled and trained staff provides the best beauty services that include bridal makeup, makeovers, hair styles, nail art and many more. We have been recognized amongst the leading organizations, engaged in offering our clients best Makeup Services. These make-up services are done keeping in mind the client's needs and budgets. Our make-up services are imparted after knowing the skin’ type of the clients. These make-up services are rendered using well-tested and branded cosmetic products. 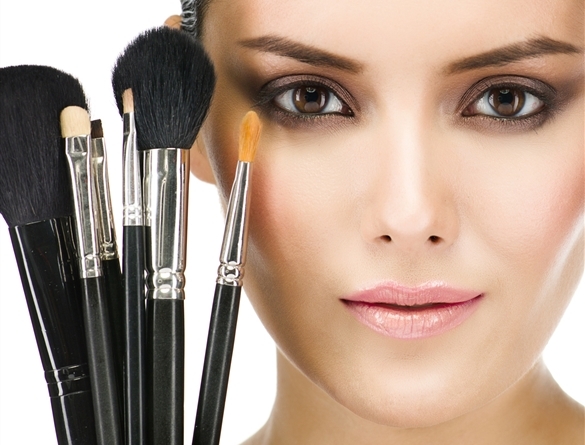 Offered make-up services are demanded in the market, owing to their client-centric approach and cost-effectiveness. There are certain events and occasions in life which warrant using beauty and makeup services. Otherwise also, maintaining your skin is important to look refreshing and glowing. As you age, signs of ageing appear on your face often taking away charm and glow. Caring for skin regularly can prevent appearance of signs. There are different types of beauty services from which you can choose the one as per your skin texture and type. At Champion Salon, well-trained and experienced beauty experts and professionals will guide you to choose the beauty services which best suit your skin. Indian weddings have lot of drama and emotions and also stressful especially for the brides because the bride and bridesmaids are always concerned about their look. The pictures of their wedding is must look best. But have you forgotten about your make-up? Or are you in a search for the best Bridal makeup artist in Udaipur? Not to worry! We will take you through the information of best wedding makeup artists in Udaipur. Champion Makeup and Hair designs in Udaipur offers basic, self arranged in Makeup and Hair styling suited perfectly to all needs of every costumer. a perfectly done makeup can do wonders, And with Champion’s skill, girls don't have any need to worry about pimple marks, patchy skin, dark circles or other blemishes on your face. With every service Salon in the soul of Udaipur is here present beauty and hair services for beautiful females. Females may come in champion salon and experience and enjoy our services with the most excellent of facials, hairstyles, waxing, manicure, pedicure and pre-bridal, bridal makeup, bridesmaid makeup services at one of our outlets. A bride is looking for her Best and the most important day of her life. Champion’s Bridal Makeup takes in the true and whole soul of marriage. From clever incurrent to bold eyes, we understand that the feelings and need of the bride. What the bride to be wants on her most special wedding day. We modify the makeup according to the bride so that her every look a class apart. Champion Salon provide Best makeup Services in Udaipur. Champion Salon has a very comprehensive and personalized approach towards giving each lady the best look because she believes every woman has the right to feel beautiful and look stunning. We use our skills and fantastic techniques to achieve this goal. Being a professional in makeup, skin and hair, she has one of the best set of skills under belt. They are successful in leaving the bride pampered and gushing. We are very well equipped with different makeup techniques. We know how to make feel even more beautiful for on the big day. Champion Salon makes sure that we only use the best kind of products that are suitable for the Indian skin tone. We are also a professional when it comes to handling the entire bridal party, transforming them for occasion’s right from the engagement to the reception. An expert in hair as well; we match the hair to the makeup and helps out in styling as well. We use bets quality products. Champion Salon is a creative Makeup Artist in Udaipur. Our all Staff passionate about their work we provide beauty and the dedication to introduce innovative techniques to apply make-up that give a natural look. If you're looking for Bridal Makeup in Udaipur Champion Salon Is one of the best Salon in Udaipur. We have makeup artists are well-trained and experienced professionals they give best and amazing looks to every bride.